Eco-friendly weddings are continuing to gain in popularity, with good reason. 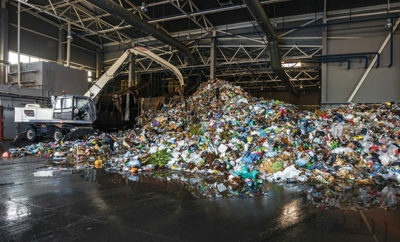 According to Kate Harrison’s The Green Bride Guide, the average American wedding produces 400 to 600 pounds of garbage and more than 60 tons of CO2 emissions. Planning an eco-friendly wedding is a beautiful way for a couple to show their love while fighting the problem of wedding waste. An added bonus is that many eco-friendly wedding ideas are budget-friendly and more creative than traditional choices. Here’s an overview of some of the latest eco-friendly wedding trends. 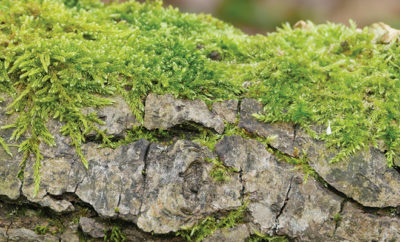 Choosing the rustic theme for a wedding provides many opportunities to incorporate eco-friendly products and practices. Popular rustic venues include barns, farms, orchards or any natural setting. Rustic decorations that are trending for eco-friendly receptions include lanterns, Mason jars and burlap table runners, with casual bunches of wildflowers and swags of greenery replacing formal floral arrangements. Using chalkboard surfaces to display information, such as seating arrangements and menus, is a popular rustic touch that reduces paper waste. Rustic trends for eco-friendly bride and bridesmaid dresses include styles that are less structured and more romantic in natural organic fabrics such as cotton, silk and linen. Many brides are choosing bouquets created from loosely gathered seasonal foliage and blooms for their rustic-themed weddings instead of traditional formal arrangements. 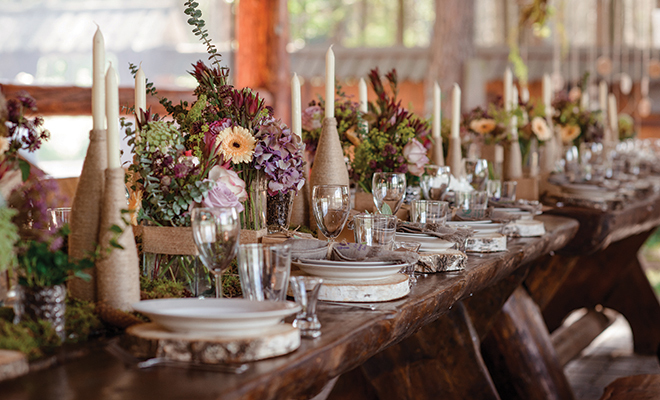 If you’ve always dreamed of a glamorous wedding, you may not gravitate toward the rustic theme. As an alternative, many brides are using a vintage theme to create a glamorous or romantic mood for their wedding while supporting the eco-friendly goals of recycling, repurposing and reusing. Vintage elements that are trending for wedding events include antique furniture pieces, vintage crystal and china and vintage lighting such as candlesticks and chandeliers. A vintage gown that fits your style can be tailored to fit and altered for a more contemporary look. Besides being eco-friendly, a vintage dress that was originally worn by the bride’s mother or grandmother adds sentimental value to the occasion. If nothing but a new wedding dress will do, look for a designer who is committed to using sustainable, organic fabrics. Now that mining for diamonds and gold has been tied to human rights violations and destruction of the environment, choosing a wedding ring has become an ethical decision. A vintage ring or a ring made from recycled gold is an eco-friendly alternative, since it saves the energy that would have gone into the creation of a new ring. Lab-grown gems are another alternative, and today’s reputable jewelers are very conscious of the sourcing of diamonds, avoiding the blood-diamond trade. The concept of local can be incorporated into any wedding theme. Keeping it local means cutting down on the amount of transportation required for all aspects of a wedding, from guests to flowers and food. Less transportation means lower CO2 emissions. Many brides are opting for out-of-the-box wedding destinations that are close to home, such as public gardens, museums and historic homes. Also expect to see more all-in-one events that minimize guest transportation by combining wedding and reception. The farm-to-table food movement provides another way for couples to minimize the transportation impact of their wedding. Caterers who specialize in serving organic foods and wines that are produced locally are becoming more popular for wedding receptions. When it comes to food service, the eco-friendly choice is a plated meal, since it generates less waste and fewer dirty dishes than a buffet. Flowers and plants that are grown locally are a much better choice for the environment compared to out-of-season or exotic flowers that must be shipped in from remote locations. Many brides are using succulents, ferns and blooming branches either in place of flowers or in combination with local blossoms. Encouraging guests to take home centerpieces and floral arrangements after the reception is becoming a popular practice, as well as donating flowers to a local church or senior center. You can also go local when it comes to wedding favors. Instead of a giving guests a trinket that was probably made overseas, eco-friendly gifts such as food and small potted plants are trending. Sending guests home with sweets from your favorite bakery or your grandma, items made by local artists or craftspeople, or even handcrafted seed packets are other unique options for favors. Sources: brides.com, greenweddingprofessionals.com and theknot.com. ← Previous Story Plug In Instead of Fuel Up!